Escape Room Inc has officially opened up its second room titled: The Diamond Heist! Click here to book today! Leonardo Notarbartolo (pictured to the left) was from Turin, Italy. Notarbartolo was known in his suburban hometown as a good husband and father. However, Notarbartolo had a pretty big record down at the local police station. From a young age, Notarbartolo was involved in petty theft and small-time burglaries. It was Leonardo who masterminded the plan and created the team for this heist. As the leader, Notarbartolo dubbed him and his partners as “La Scuola di Torino” (The School of Turin). 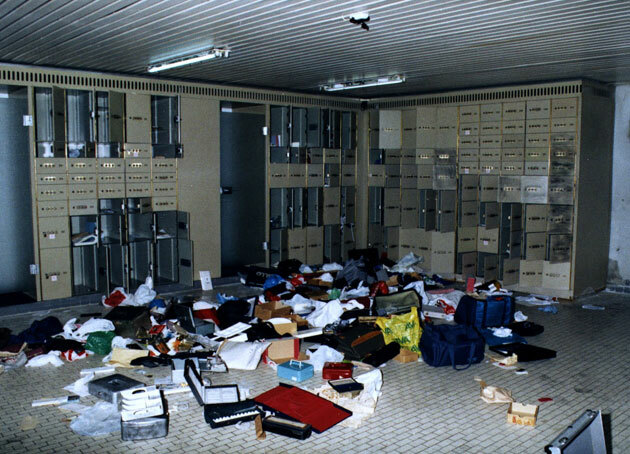 On February 15-16, 2003, it is estimated that at least $100 million worth of diamonds were stolen from the vaults in the Antwerp World Diamond Centre, located in Belgium. It took Leonardo four years to plan this huge heist. First, they leased offices in the area and posed as diamond merchants. By doing so, they were able to scope out the center’s security routines, layout, and alarm systems. On the day of the heist, the team used a combination of methods. For instance, the team mimicked an infrared code to fool the garage-door sensors. The team even used a custom-made slab of aluminum to reposition the magnetic field that caused the vault door to lock. An interesting low-tech hack that was used was when the team sprayed hair-spray on heat detectors to temporarily disable them. Eventually they entered the vault and the team emptied 123 of the 160 safety-deposit boxes. Unable to carry all the diamonds from the boxes, the five-man team ran away leaving the rest unopened and the floor covered with diamonds. for a video surveillance system with Leonardo Notarbartolo’s signature on it. Next, a business card was found with the information of Elio D’Onorio, a well-known electronics expert in the area that was tied to previous robberies. Therefore, the investigators assumed him to be part of the team. Lastly, a half-eaten salami sandwich was found. Why is this important? Well, when detectives went to Leonardo’s home, they found a receipt from the same store that was printed on the packaging of the sandwich. Considering the receipt had a time-stamp on it, the investigators asked for the footage of that night. They found Ferdinando Finotto on film. They later assumed Ferdinando to be part of the five-man team. This gave the investigators enough reason to search for Notarbartolo. At first, the police could not find Notarbartolo. He had immediately fled the area after the heist. Considering he never knew the garbage had been found, Notarbartolo thought the coast was clear and went home. Of course, if they had not found the garbage, perhaps that would have been true. The day he got back, the police bombarded his home and caught him. In fact, they actually caught him in the process of getting rid of some more garbage bags. In these new bags, they found SIM cards linking Leonardo to Ferdinando, Elio, and Pietro Tavano (another long time friend of Leonardo and assumed accomplice). They also found 17 polished diamonds attached to certificates that the Belgian diamond detectives traced back to the vault. With all this evidence, Notarbartolo was only sentenced ten years in prison and his three identified partners were sentenced to five years. Notarbartolo has never confirmed these men to be his accomplices, nor has he ever named any accomplices. The diamonds were never found.